Hafter speaking live on Alhadath TV this evening upon his arrival at Benghazi’s Benina airport (Photo grab: Alhadath TV). Khalifa Hafter returned to Libya late this afternoon, ending speculation about his very poor health or death. Stories of his alleged demise started to circulate two weeks ago. Dressed in a suite and tie, Hafter arrived to celebrations at Benghazi’s Benina airport, walking and talking and looking in reasonable health. ‘‘I want to assure you I am in good health’’, he told his gathered audience of tribal leaders and LNA commanders live on air on the pro-LNA Al Hadath satellite TV station. He seemed apologetic that he was forced to address his audience while sitting down claiming that ‘‘it was forced upon me to sit on this armchair which was provided’’. 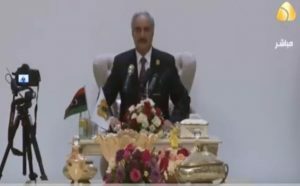 Hafter spoke only briefly from his Rajmah HQ, and gave no details of his illness or his whereabout over the last two weeks. He did however have a brief dig at his enemies. ‘‘Libya must be freed from all these groups. They must be ended and especially after what we heard these days’’, he said referring to the news disseminated by anti-Hafter media outlets of his premature death. He also seemed to send out a threat to those within the LNA who had shown less than full loyalty during his absence.